If you still doubt the value of mathematics and science, just ask William Cronje and Reinardt Atkinson to share their future prospects with you. 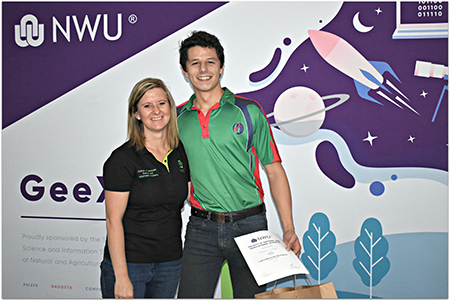 William, a Grade 11 learner from Vereeniging Gymnasium, and Reinardt, a final year BSc IT student, recently programmed and calculated their way to success during the annual North-West University (NWU) GeeXpo event. Both William and Reinardt won full study bursaries in computer and information science from the NWU, William for his undergraduate studies in 2020 and Reinardt for his honours degree in 2019. 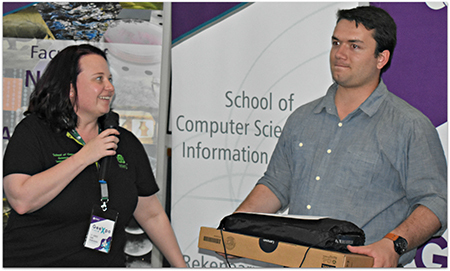 The recent GeeXpo event, which is a highlight on the Faculty of Natural and Agricultural Science’s calendar, focused on information technology, mathematics and statistical sciences and attracted hundreds of learners from across central South Africa. In fact, this year saw a record number of participants taking part in the Maths Olympiad and the PAT Competition. According to Daleen Gerber, director of the School of Mathematics and Applied Mathematics, the impact of the annual expo is unlocked by the way in it enables learners to experience the full spectrum of professional opportunities that can be associated with mathematics and computer science. At the same time, the expo is also a platform from where academic distinction can be celebrated. The latter referring to the winners in the different GeeXpo categories, namely: Robotics – as hosted by Trophy Robotics, Maths Olympiad, Cyber Security Challenge, Britehouse Competition and the popular PAT Challenge. The Cyber Security Challenge and the Britehouse Competition are for final year IT students at the NWU. The organisers of the event would like to thank the following sponsors and partners who contributed towards the success of the event: Sharp, Van Schaik Bookstore, Britehouse, Binary Space, CASIO, Fourier, NWU managers and staff. Sune van der Linde (NWU) and William Cronje. JT Janse van Rensburg (NWU) and Reinardt Atkinson.